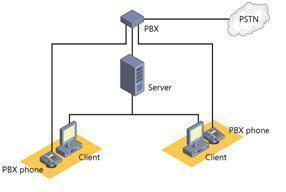 A PBX (Private Branch Exchange) is a small telephone switch that a company or organization owns. These organizations purchase PBXs to reduce the total number of telephone lines they need to lease from the telephone company. 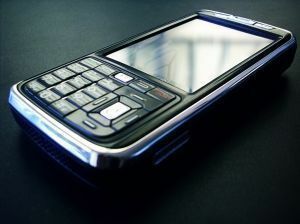 Without a PBX, a company has to lease one telephone line for every employee with a telephone. In a PBX system, every telephone is wired to the PBX. When an employee takes the receiver off hook (i.e. picks up the telephone) and dials the outside access code (usually 9), the PBX connects the employee to an outside line (often, though somewhat incorrectly, referred to as a trunk). Most modern PBX systems are able to mix traditional analog POTS connectivity, digital lines like T1’s and T3’s, and IP connections for VoIP telephony. This allows PBX operators to minimize telecommunications costs by using the most efficient connection possible for each call. Two common PBX systems are Avaya’s Definity series (also known as the System 75 and Sytem 85) and Northern Telecom’s Meridian series. Other PBX manufacturers include Siemens, NEC, and Mitel. 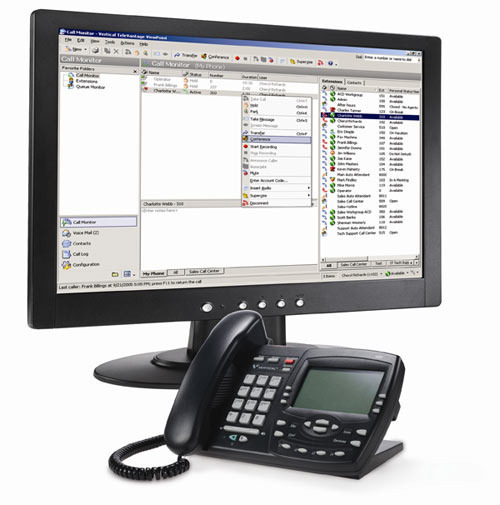 Several complete software-based PBX systems are available as open source software. These packages are provided at no cost and have large support networks of existing users who provide product support. Asterisk is a complete PBX in software. Asterisk runs on BSD Unix, Linux, and Mac OSX and provides all of the features expected from a top of the line hardware-based PBX. Asterisk supports VoIP in many protocols and can inter-operate with almost all standards-based telephony equipment using relatively inexpensive hardware. Among its many features, Asterisk provides IVR capabilities. GNU Bayonne, the telephony server of GNU Telephony and the GNU project, offers a free, scalable, media independent software environment for development and deployment of telephony solutions used with current and next generation telephone networks. GNU Bayonne supports IVR scripting with hardware from Voicetronix, Dialogic, Aculab, CAPI drivers, and Quicklink drivers under GNU/Linux. Bayonne performs script driven IVR applications written in GNU Bayonne’s native scripting language as well as access, conversion, and audio playing from remote URLs. FreeSWITCH is an open source telephony application written in C, built from the ground up, and designed to take advantage of as many existing software libraries as possible. FreeSWITCH makes it possible to build an open source PBX system or an open source VOIP switching platform as well as unite various technologies such as SIP, H.323, IAX2, LDAP, Zeroconf, XMPP/Jingle, etc. FreeSWITCH can also be used to interface with other open source PBX systems such as Asterisk, GNU Bayonne, or OpenPBX. OpenPBX.org is an open Source Private Branch Exchange System (PBX) in software for the Linux Operating system. OpenPBX.org is licensed under the GNU General Public License (GPL). How many out going calls can be made at one time through EPABX? According to this if you have two EPABX lines they can be divided into 8 lines so calls are possible from 8 numbers at the same time. Do you’ll Have a Recording of the howler tone? 494 queries in 0.818 seconds.